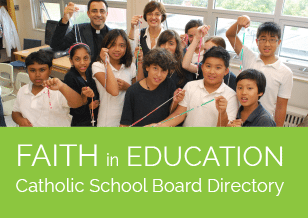 Once again, following a tradition created by the 2013-14 Catholic Student Trustee leadership team, boards were invited to celebrate the Catholic Education Week Mass on May 7th as part of a province-wide celebration of our faith and unity as a system. In addition to the celebration of Mass, this year’s student trustee leadership team, led by Catholic Board Council President, Joe McLeod and Vice President, Quinn Scarlett, developed another original element for Catholic Education Week–the first ever Ontario Catholic Student Youth Day (OCSYD), which also took place on May 7th. As was done last year, student leaders wrote a formal letter to Pope Francis requesting the Holy Father’s words of encouragement for this year’s Mass and launch of OCSYD. 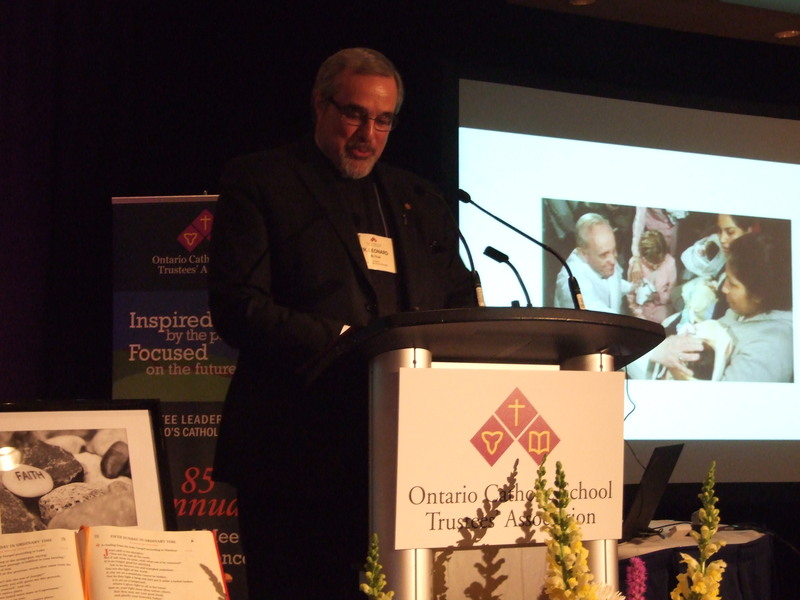 OCSTA is pleased to announce that the Association’s Executive Director, Kevin Kobus, was recently presented with the Catholic Principals’ Council of Ontario’s Fr. 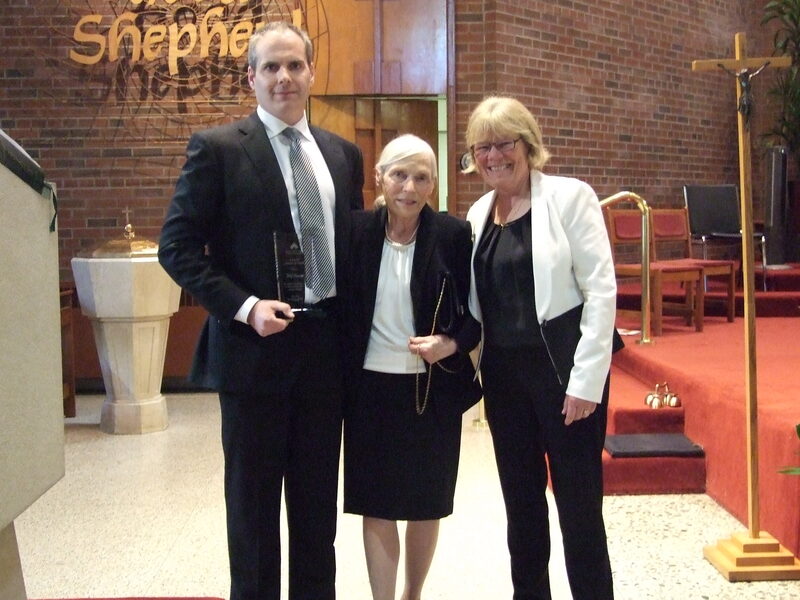 John Redmond Memorial Award. 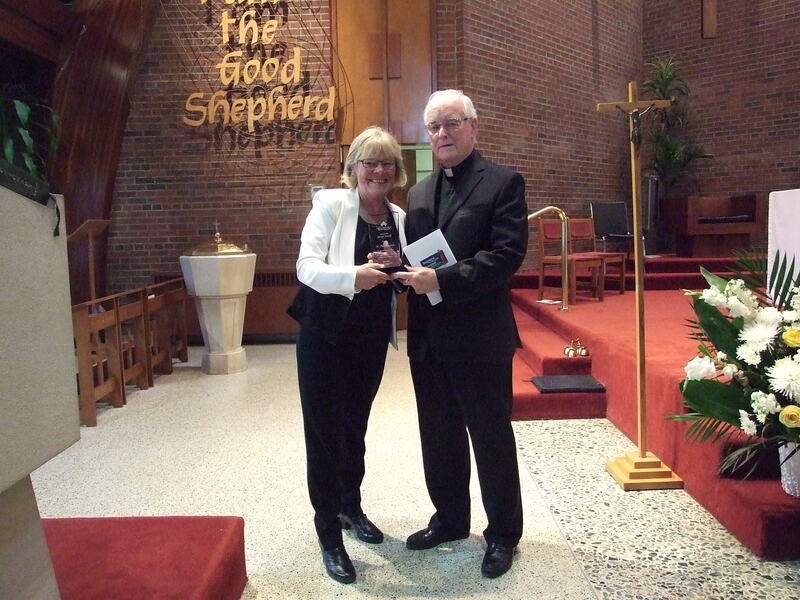 This award annually recognizes extraordinary service in Catholic education at the provincial level. 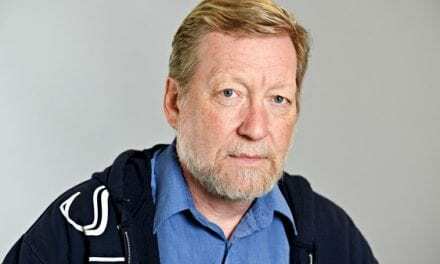 Kevin’s career spans four decades and includes successful terms as Director of Education at the largest Catholic school board in the country, the Toronto Catholic District School Board, and at the Simcoe Muskoka Catholic District School Board in the beautiful Georgian Bay region. 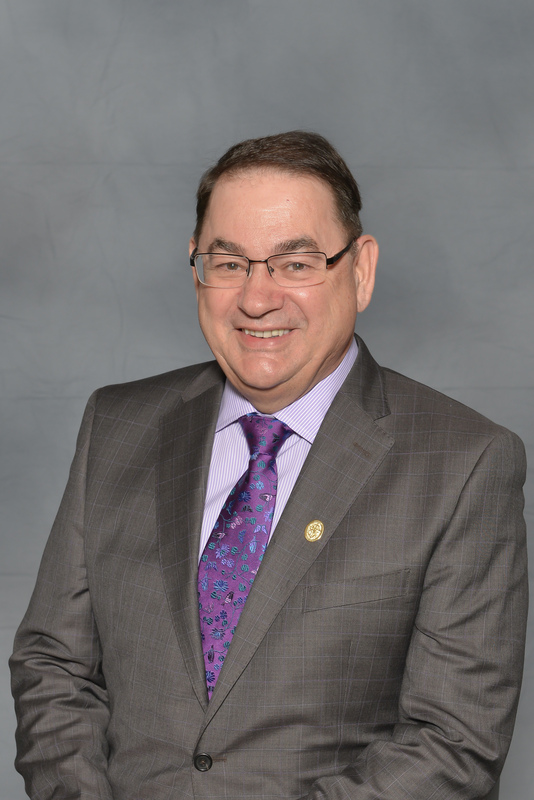 During his career, Kevin was also appointed to various roles at the Ministry of Education, including Assistant Deputy Minister, Business and Finance Division, Elementary and Secondary Schools. OCSTA President, Kathy Burtnik, with Gr. 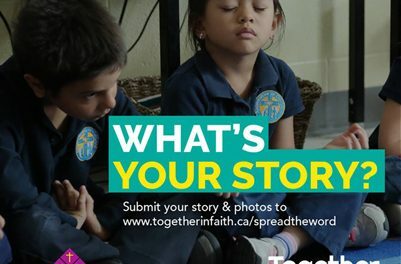 2-3 students from Our Lady of Sorrows Catholic School, TCDSB. 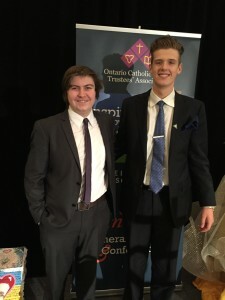 OCSTA celebrated a successful 85th Anniversary at the recent Annual General Meeting and Conference in Toronto (April 30 – May 2). Our sincere thanks and appreciation are extended to our co-host board, the Toronto Catholic District School Board, for providing poignant and beautiful liturgies and presentations by students, staff and trustees throughout this year’s event. OCSTA was pleased to award the 2015 Trustee Award of Merit posthumously to Wilf Garrah of the Algonquin and Lakeshore CDSB, who sadly passed away in 2013, but was recognized and celebrated at this year’s gathering for his long-standing commitment to Catholic education in Ontario. 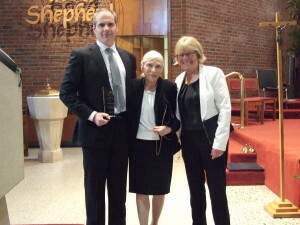 Accepting this award was Wilf’s wife Judy and his son Ryan. 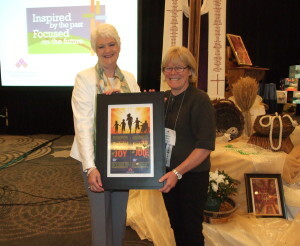 The Association was also pleased to recognize the support, insight and faith-filled leadership demonstrated over 40 years by OCSTA Chaplain and veteran educator, Fr. Patrick Fitzpatrick. Fr. 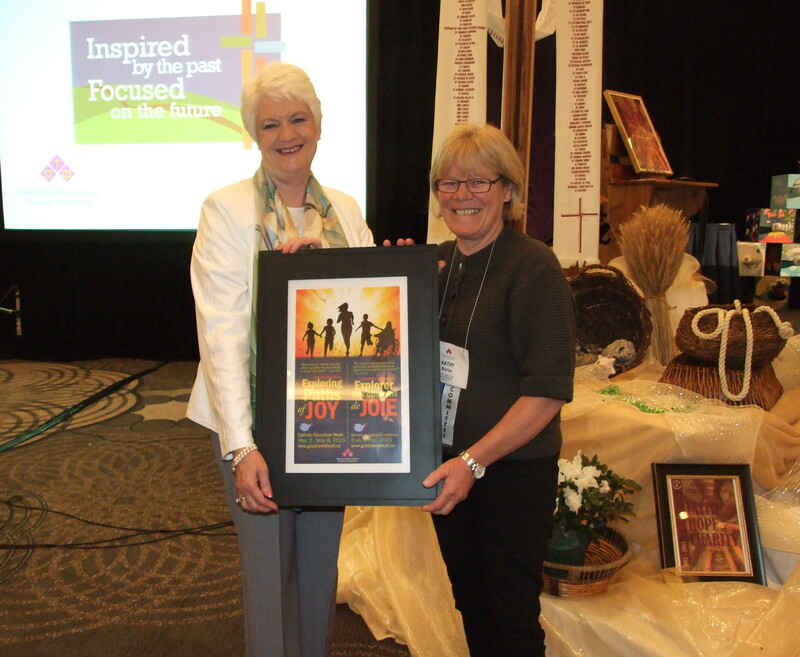 Pat was presented with the 2015 OCSTA Special Award. The following trustees were acknowledged for 25 years of service (or more) to Catholic education: Anna Maria Abbruscato, Dufferin-Peel CDSB; Marino Gazzola, Wellington CDSB; Mario Pascucci, Dufferin-Peel CDSB; and Bob Schreader, Renfrew County CDSB. 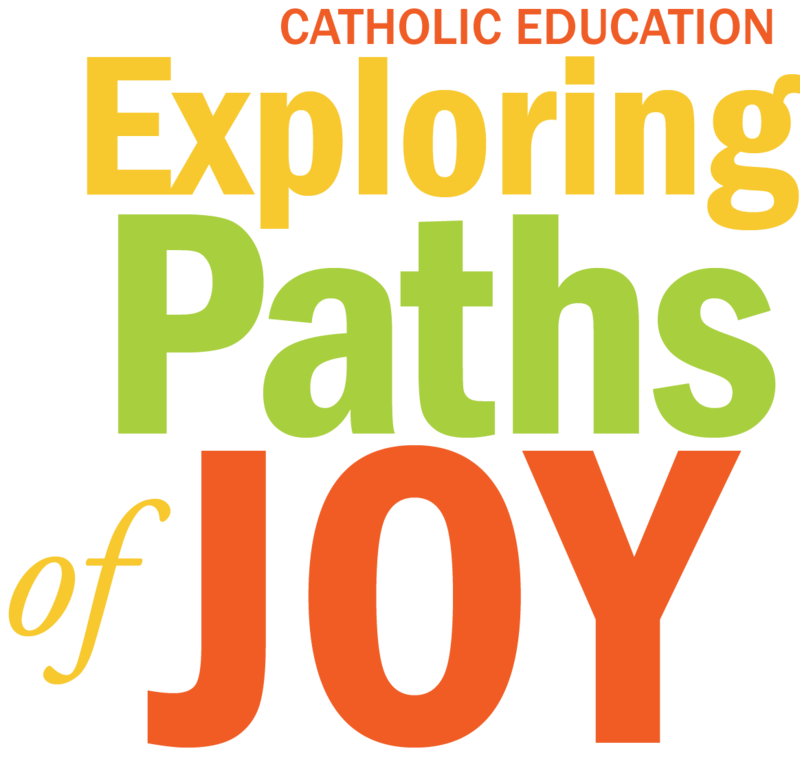 The OCSTA Conference program included many informative speakers including keynote presenter, Fr. Leonard Altilia whose presentation was entitled: “The Francis Effect” and the Future of Catholic Education. 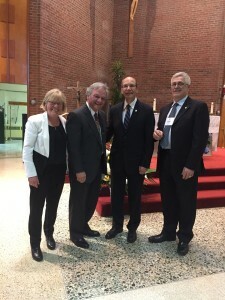 As always, the Association was pleased to welcome the Minister of Education, The Hon. Liz Sandals who discussed the government’s current education platform and answered questions from delegates.